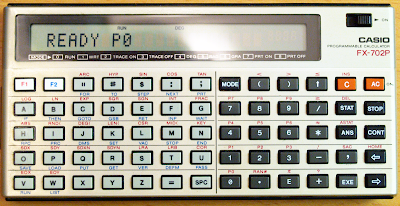 This is a pocket calculator I had when I was in the high school. I remember saving a lot of money and coins to buy it. 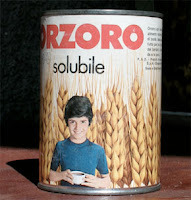 I kept my money in an old malt can 'orzoro'. Then I went to my dad and asked him to buy the calculator for me. It was 1982 I guess. I was 16. I enjoyed a lot programming it, and also has some correspondent around, and we were exchanging code. I remember testing a lot of sort algorithms to identify the best performer. Bubble sort, inserion sort, shell-metzner sort, quicksort. I remember trying hard to understand quicksort. I developed a game on it, along with my friend Marco Crosa. It was a kind of shooting game, but difficult to do something very dynamic on a single line of text display. Then I was hacking it, and bought the printer too to print my programs. The printer was not able to print lower case letters, but I hacked the calculator and was able to find strange codes that corresponded, when printed, to the lowercase letters. In the same period my friend Daniele Stella was hacking with the Hewlett Packard HP 41. Ciao Davide,Io dovrei avere ancora questa calcolatrice, ma la devo ritrovare. Avevo anche la stampantina. Dovrebbe essere in buone condizioni. Non credo di avere problemi a vendertela.